This Liquid Motion Glow is a great addition to any room adding a calming effect with the smooth flowing motion within the lamp. The constantly flowing liquid is beautifully lit from the bottom by a 15 watt included bulb. Bubbles in the glass bottle move serenely in the clear liquid. 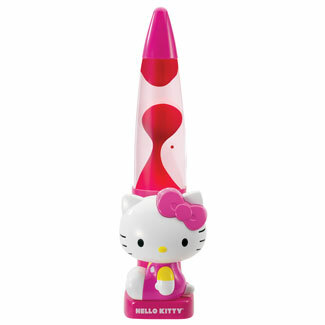 Just below the cylinder, there is an adorable Hello Kitty figurine to complete this compact, unique item.